With Live Event Streaming you can broadcast live events over the internet and allow people to watch the events from a web browser. Broadcast monthly meetings, conventions and seminars, training classes, or any live event where you have a computer and internet connection setup. All you need at the event is a computer or laptop, a webcam or digital camcorder, and a broadband internet connection. 1. Computer or laptop with a webcam or digital video recording device attached to it (for example, a digital camera). For audio there must be a microphone either attached to the video recording device or attached directly to the computer. Follow the instructions included with your specific video recording device for attaching it to the computer or laptop. 2. Broadband Internet Connection for the computer or laptop. 3. "Adobe Flash Media Encoder 2.5" software installed on the computer or laptop. The software is a free download that we will provide to you. 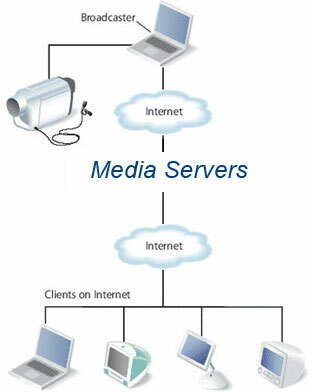 The live broadcast is streamed from the computer or laptop directly to our media servers where it is made available through a web browser. Your users will go to a specific link in your website to watch the event. See diagram. Choose a package below based on the number of users you expect to watch the live event at one time. If you require live streaming for more than 300 simultaneous users contact us for a quote. - If you require live streaming for more than 300 simultaneous users contact us for a quote. * The maximum number of viewers that may be connected to your live broadcast at a single time. ** Overage charge for data transfer is $3.00 per GB of data transfer over the plan amount. Estimate the amount of data transfer your live streaming events account will need every month. Enter the average amount of time you expect viewers to watch the stream. 1000 MB = 1 GB. Contact us at 1-888-248-5557 to order a Live Streaming Plan today!